Even before your child’s first baby teeth start erupting, you’ll need to start cleaning their gums. A good time to do this is after feedings as this helps fight bacterial growth and promotes good oral health. You’ll also want your baby to get used to having their mouth cleaned daily so they know what to expect when their baby teeth come in. Cleaning their gums with a soft damp washcloth is fine. Simply wrap it around your index finger and gently rub it over them. We’ll discuss other devices you can use in a bit if you’d prefer an alternative. As you your baby reaches 6 months, their baby teeth may start to appear. Once they do, brush their teeth at least once a day before bedtime, but twice a day doesn’t hurt. Use a soft-bristled brush with a small head. Check the packaging to see if it’s designed specifically for infants. Doing this will prevent plaque buildup and protect your baby from gingivitis, which can both affect their mouth development if not avoided. The American Academy of Pediatric Dentistry recommends using cavity-preventing fluoride toothpaste as soon as their first tooth comes in. Start with a rice grain-sized amount first, then graduate to a pea-sized amount at age 3. There are many products out there designed to clean your baby’s mouth, before and after their teeth come in. Keep these in mind while you’re out shopping for them. When you’re cleaning your child’s mouth for the first time, consider a brush that fits right on your finger such as the Brushies’s Momo the Monkey silicone, BPA-free brush. 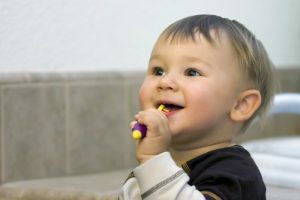 You can also look at the Baby Banana Infant Training Toothbrush, which is easy for babies to hold onto and gets them used to brushing their gums and new baby teeth. For children with more baby teeth, consider Jordan’s Step 1 baby toothbrush, which comes in many different colors and is equipped with super soft bristles on a small paddle head, making it ideal for brushing their tiny mouths. The bristles even act as a guide for how much fluoride toothpaste is safe to use. Know the tools to brush your baby’s teeth and they’ll be smiling for a lifetime. 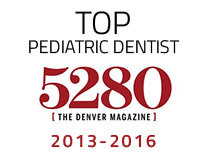 Contact your children’s dentist in Castle Rock to learn more! 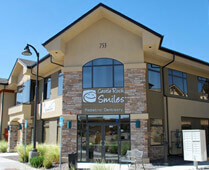 Dr. Layne Benzley, DDS, earned his bachelor’s degree in economics from Brigham Young University. He went on to earn his Doctor of Dental Surgery degree from the University of Iowa and his pediatric dental specialty certificate from the Eastman Dental Center at the University of Rochester in New York. To learn more about his practice, contact him at (303) 660-5373 or visit his website.